This week 5 elite athletes give an insight into their careers. This includes some of the habits that have helped them achieve their success. Which should help you on the path to your own success. Mimi holds multiple records for ultra running events and challenges across the world. These include the record for the fastest run from John o’ Groats to Lands End for a female. To do that, she ran more than 800 miles in 12 days. Which makes her the perfect coach for me as I attempt to break the men’s world record for the opposite route, Lands End to John o’ Groats, in May 2019. She’s also won multiple endurance events, including many outright wins, beating males as well as females! Lisa has world class running pedigree and represented Australia at the Beijing 2008 Olympics in the 1,500m. She’s also been the Australian champion over 800m and 1,500m multiple times. Evie competed in the ITU Triathlon World Championships on the Gold Coast in Australia in September 2018. And combining this high level of performance with her day job as a sports psychologist means that she can give us all a huge amount of valuable advice across a number of topics. She’s also doing a fantastic job as my sports psychologist. Steve is a very experienced British marathon and ultra marathon runner living in the US. He’s got a phenomenal 100 mile PB of 15 hours, 26 minutes and 25 seconds, has run 140 miles in a 24 hour race and placed 4th in the famous Rocky Raccoon 100 Mile Race. James was a fairly latecomer to running, but has achieved high levels of success very quickly. 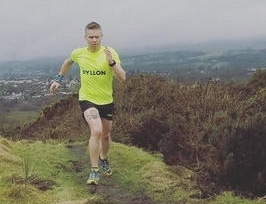 He’s won the Rocky Raccoon 100 mile race, the West Highland Way Race and represents Scotland and Great Britain in ultra running events, including the GB 24 hour squad. This is the first of two parts of the interviews with these elite athletes. Simply provide your email to get updated when part 2 comes. You’ll also get a FREE training plan template, which will save you time, money and effort when creating your own training programme! Now, it’s time to hear from the elite athletes! What's Your Proudest Athletic Achievement? Mimi Anderson - I’m proud of everything I’ve achieved in my running career, all for different reasons. But I think my two best achievements are the Spartathlon in 2011 and my Malin Head to Mizen Head World Record in 2012. The Spartathlon is a 153 mile non-stop race in Greece starting at the Acropolis in Athens and finishing at Sparta in 36 hours. At the 100 mile point there is a mountain to go up and over (always in the dark). The race is made more difficult because of the 74 check points along the route, all with their own cut-offs. So competitors are constantly chasing time. In 2011 I finished 3rd female. A moment I will never forget, especially as the race attracts high calibre runners from around the world. The Malin Head to Mizen Head challenge took place in September 2012. During the 345 mile world record attempt I had a support crew of three looking after me. My aim was to complete the run in 3.5 days which I knew would be a big ask. Everything went well and I felt good breaking the record in 3 days 15 hours, taking over 10 hours off the previous record that had only been set in March of that year. Although not my 3.5 days I came away knowing I had given it my all. I couldn’t have asked any more of my body! Lisa Corrigan - Competing in the Beijing 2008 Olympic Games for Australia. I raced in the 1500m. So a tad different to the distance you run James! The first was helping a fellow triathlete during the run stage of a race. As I ran up alongside her, it was clear she was struggling. I happened to have water and gels on me and offered her some. She was so grateful and after the race, came to thank me for slowing down to help her. The second was taking part in the ITU World Series Age Group standard triathlon on the Gold Coast, because my family and friends were all there to cheer me on! I loved the race and the atmosphere. To come 3rd Brit and 13th overall in my age group was unexpected and a proud moment too! Steve Speirs - Tough question! Possibly finishing the Western States 100 and earning the sub-24 buckle. James Stewart - It has to be going from being 5 stone heavier than I am now in late 2011 to winning my first GB vest in 2017. That was a remarkable, incremental, ‘howthehelldidIenduphere’ journey. The things I did along the way such as winning the West Highland Way, running for Scotland or winning Rocky Raccoon wouldn’t have made any sense to my pre-2011 self. Nor would they have even been remotely believable. Mimi - Difficult to say which is my favourite race as they are all so different and you can’t really compare. But I think the Arctic race has to be up there. The 6633 Arctic Ultra was a 352 mile (it’s now longer) non-stop, self sufficiency race in the Canadian Arctic over 8 days, in temperatures as low as minus 40! There really isn’t anything quite like it. It’s the only race that starts so far north, goes through the Arctic Circle, takes runners for 120 miles on an ice road and finishes on the Arctic Ocean! I finished in just under 6 days, winning the race overall (male and female) and finishing 24 hours ahead of the only other person to finish that year. Lisa - The Noosa Bolt 5km here in Australia. Noosa is a beautiful place and it’s such a fun and competitive race. Evie - Again there are two. New York Marathon in 2010. The support from the crowd and all those involved was unforgettable. And a mountain marathon in Austria with my best friend. The scenery was breathtaking and sharing it with my husband and good friends was unforgettable. Steve - So many great events out there, but the Western States 100 was probably the most special. James - The West Highland Way. This is the home big one. It’s not got the sense of worldwide grandeur a Western States or UTMB has – and in some ways that makes it more endearing - but it is on some of the most amazing scenery on the planet and shows Scotland off magnificently. The fact I have only run it once rankles with me! James Stewart’s favourite face is the West Highland Way in Scotland. What's Your Favourite Race Food? Mimi - Food is something that I struggle with while racing as my body doesn’t seem to tell me when I’m hungry! The cravings for food depends on the climate I’m racing in. During Badwater in the USA I loved fizzy water and iced coffee! On my run across America it was ice cream. On staged races it would be nuts and raisins. And if I’m struggling to get food into me then baby food is ideal! Lisa - I would always have spaghetti bolognese. Evie - Dates and madeleine cakes on long rides! James - Home baking. But the #1 answer here is my sister-in-law Alison’s banana bread. What's The One Piece of Kit You Couldn't Live Without? It can be used for a multitude of things from keeping my hair off my face and wrapping it around my wrist having soaked it in water to keep me cool in hot races. I’ve used it on my face in a sandstorm and have been known to wear it as a mini skirt while sitting in camp during a multi-staged race in South Africa. Lisa - My running spikes! Do You Have Any Strange, Interesting or Weird Race Superstitions, Routines, Charms, etc? Mimi - Since doing the Marathon des Sables in 2001 I have always worn a beautiful bar broach that was given to me by my Godmother. It would be pinned to the inside of my crop-top above my heart. But I know that whoever finds it will carry good luck with them - it was obviously time for me to move onto something else. Lisa - I always kept a small ‘lucky’ teddy in my spike bag and kissed it before a race!!! Evie - Even race numbers! One day I was given an odd race number and obviously had to race with it - nothing out of the ordinary happened so I gave myself a good talking to and decided that odd or even, a race is a race! Steve - I guess my lucky pre-race Guinness. James - Nah. Apart from the pre-race need to empty the bowels I just lace up and run. Oh, wait, actually, I always buy new socks before an ultra. Simply sign up with your email to get updated when part 2 of the interview is out. it will include even more tips and interesting information. Older Post1st Place at the Autumn 100 Mile Race - My Preparation, Race Review and A Free Checklist!